In Alabama, where have all the Reform rabbis gone? 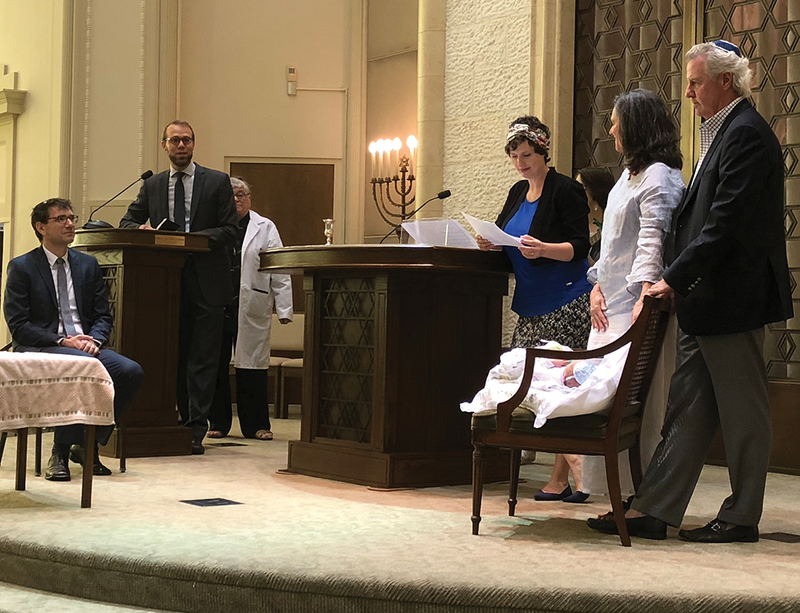 Three weeks after arriving in Birmingham, Bethany and Rabbi Stephen Slater have a bris for their newborn son, at Temple Beth-El on July 4. Slater, who just started as rabbi of the state's largest Conservative congregation, did the procedure, assisted by Fran Ivker. (July 19 Update: Temple B'nai Sholom in Huntsville named Eric Berk as its new rabbi, making two full-time Reform pulpit rabbis in Alabama). With the announcement that Temple Beth Or in Montgomery has hired Rabbi Scott Looper as its new rabbi, Reform congregations in Alabama have avoided an unprecedented circumstance. Before a June 10 congregational meeting at Beth Or, it looked like there would be no full-time Reform pulpit rabbis in Alabama for the coming year. As it stands, only one Reform congregation — Beth Or, which has 137 families — will have a full-time rabbi, something that has not happened in the state since the 1800s, when there were fewer, and smaller, congregations. In a state where many rabbis have lengthy tenures, this circumstance is seen as a fluke because of two retirements around the same time, and unfruitful rabbinic searches. Those involved in searches at some of the congregations related that the U.S. Senate special election in Alabama was a hindrance, as some were reluctant to apply before the Dec. 12 vote, with former Alabama Chief Justice Roy Moore seen as the strong favorite. Moore’s religious grandstanding led to him being removed from office twice for ignoring court orders that went against his interpretation of his religious obligations. He also was dogged by allegations of long-ago improper relationships with then-underage girls. Democrat Doug Jones eventually won the special election. Beth Or’s previous rabbi, Elliot Stevens, died in June 2017 after a bout with pancreatic cancer. Ordained by Hebrew Union College-Jewish Institute of Religion in Cincinnati in 1989, Looper left Or Shalom in the Chicago area in 2014 after 20 years with the congregation. Last year, there were just two full-time Reform pulpit rabbis in Alabama, already an unusually low number. Temple B’nai Sholom had Rabbi Elizabeth Bahar, who left in June to take a pulpit in Jacksonville after nine years in Huntsville. Springhill Avenue Temple in Mobile had Rabbi Dana Kaplan, who came to the congregation as an interim rabbi in 2015, following the retirement of Rabbi Donald Kunstadt. Kunstadt had been at the Mobile congregation since 1987. Kaplan, who had previously been rabbi of the United Congregation of Israelites in Jamaica, and B’nai Israel in Albany, Ga., was asked to stay beyond his interim year, but last month, it was announced that he would not continue with the congregation when his current contract ends on July 31. On June 8, an email from Springhill Avenue Temple President Mike Pereira informed the congregation that on June 6, a rabbinic search committee had been formed, with Alan Goldberg and Maure Sternberg as co-chairs. Birmingham’s Temple Emanu-El, which is the state’s largest synagogue with 609 families, had an interim rabbi this past year, Douglas Kohn, following the 2017 retirement of Rabbi Jonathan Miller, who came to Emanu-El in 1991. Emanu-El will be served by Student Rabbi Leah Nussbaum twice a month starting in September, while the search for a full-time rabbi will take place this year. Emanu-El has an interim director of education, Lynda Gutcheon, and a new director of congregational engagement, Monika Flurer Singletary. The other Alabama Reform congregation that had a full-time rabbi recently is Temple Emanu-El in Dothan, where Rabbi Lynne Goldsmith retired in 2017 after 10 years in the town. They will have a student rabbi this year. Among other Reform congregations in the state, Tuscaloosa’s Temple Emanu-El is served part-time by Rabbi Steven Jacobs, the Aaron Aronov Chair of Judaic Studies at the University of Alabama. Mishkan Israel in Selma has only a handful of members remaining. Beth Shalom in Auburn receives educational and rabbinic services from the Goldring/Woldenberg Institute of Southern Jewish Life in Jackson. On June 22, Rabbi Irving Bloom retired from Temple Beth-El in Anniston, where he had been visiting rabbi for 15 years, traveling monthly from Atlanta. Florence’s B’nai Israel is served every other week by Rabbi Nancy Tunick of Nashville. Among Conservative congregations in the state, Rabbi Steven Silberman has been at Mobile’s Ahavas Chesed since 1990 and is now the pulpit rabbi with the longest single-congregation tenure in the state, and Rabbi Scott Kramer has been at Agudath Israel-Etz Ahayem in Montgomery since 2007. Birmingham's Temple Beth-El, the state’s largest Conservative congregation, welcomed Rabbi Stephen Slater in June, and he and his wife had a son on June 27, two weeks after arriving in the city. For the last two years, Rabbi Barry Leff has served as Beth-El's interim rabbi. Etz Chayim in Huntsville, the state’s smallest Conservative congregation, does not have a full-time rabbi, but Rabbi Stephen Listfield visits monthly from Atlanta. Rabbi Moshe Rube started at Birmingham’s Knesseth Israel, the state’s Orthodox congregation, in 2017. With just one year, he is the longest-serving congregational rabbi in the state’s largest Jewish community. Chabad maintains a rabbinic presence and educational centers in Birmingham, Huntsville, Tuscaloosa and Mobile. Southern Jewish Life: In Alabama, where have all the Reform rabbis gone?